Taoiseach Brian Cowen has angrily denied suggestions that he was attempting to protect anyone involved in the Anglo Irish Bank share scandal. 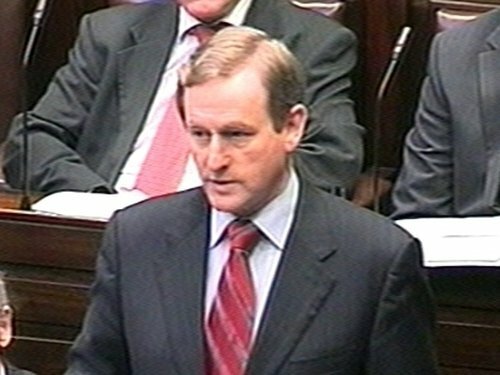 He accused Enda Kenny of impugning his reputation, a charge rejected by the Fine Gael leader. Mr Cowen also told the Dáil the Government was determined to ensure that due process was followed and that if wrong-doing was uncovered, people would face the legal consequences. The Minister for Justice, Dermot Ahern, meanwhile, said he would prefer that the ten individuals involved be revealed, but that due process must be allowed to take its course. It is understood the annual report of Anglo Irish Bank, which is expected to be published on Friday, will reveal a property owned by a member of Sean FitzPatrick's family was rented by the bank. It is understood the property is in London. The Taoiseach said he regarded regulatory reform of banking as a top priority. In relation to the so-called 'Golden Circle' of ten shareholders, he said the issue arose because of due diligence by Government. Mr Cowen also said it was nonsense to suggest the Government was nationalising a bank to protect some people. He said the debts remained and the Government would ensure that the debts would be collected by the bank. Speaking on RTÉ's Six-One News, Mr Kenny said the public deserved to know the names of the 'golden circle'. He said the Irish people now own Anglo Irish Bank and 'are entitled to know what is going on'. A spokesman for the Taoiseach has said Mr Cowen did answer Mr Kenny's question about whether any member of the Cabinet encouraged the Anglo Irish share deal. The Dáil record shows that Mr Cowen said no member of the Government was involved in what was an internal bank matter. Earlier, Mr Kenny said the Government had been 'far too timid' about the situation in financial institutions, because it was responsible for the failure to regulate the banks properly. He asked the Taoiseach if he agreed that 'a fraud had been perpetrated on the Irish Stock Exchange'. Labour leader Eamon Gilmore (below) asked why Mr Cowen, when he was Minister for Finance, had ordered the Revenue Commissioners to reverse its decision to impose stamp duty on Contracts for Difference. CFDs are high-risk investment products where investors can bet on the future direction of a stock without having to actually buy the shares. Mr Gilmore said Mr Cowen had already confirmed he had been lobbied about the issue, and asked for the identity of those involved. Mr Gilmore added that when the decision was reversed, people continued gambling on the stock market, because they were paying no tax. Mr Cowen said as far as he recalled, the lobbying came from a professional body, but he promised to check with the Department and supply details. The Green Party, meanwhile, has said it could review its support for the Government if politicians are implicated in the latest banking scandal. ‘We are committed to remaining in Government but that is not an open-ended commitment,’ Green Party Chairman Dan Boyle told Reuters. Senator Boyle said it was crucial that no politicians be directly linked to the scandals. ‘If it comes down to compromises in relation to (the) political system getting involved or being identified in terms of individuals of political parties with the ongoing sharp banking practices then that would cause us to review our position,’ he said. Remaining questions about the scandals should be answered quickly instead of the recent ‘drip-drip’ of revelations so the damage to Ireland's reputation can be repaired, Senator Boyle said. ‘Ireland's credibility has been dealt a massive blow because of a failure of regulation and the sharp banking practices which have caused significant damage to our international reputation,’ Senator Boyle said.